Hiking Rocky Mountain National Park: North Inlet Basin- Water. Last week brought my farthest drive to date in pursuit of this goal. I went all the way through RMNP, entering at Fall River and exiting at Grand Lake. I didn't really do any planning on how to get to the North Inlet trailhead- I assumed it would be well signed and I would have no trouble finding it. I didn't see any signs, though I may have missed them in the darkness, but I followed the most logical route, stopped and looked at the topo, and then finally saw a sign for the trailhead moments later. All of this, of course, while you were still likely asleep! I made good time on the drive over, and started from the trailhead at 4:52. I had the feeling it was going to be a long day. By darkness I made my way past some private property that housed horses. I could definitely smell them, and soon enough I saw them. White horses lit by a headlamp at night definitely look like demons of some sort, with glowing eyes that see right into your soul. You'll also pass by a small cabin. I am certainly envious of the owner of this place. After passing by Summerland Park, my first goal for the day was the 9723 foot ranked but unofficially named Cascade Falls Point. On the topo, this is the high point almost directly north west of Cascade Falls. I left the trail at some of the flatter areas south of the point, and planned to go up into the saddle and then up the west side of the peak. The bushwhacking was a bit more intense than I have seen this year, and I took a more direct approach to the top. This small peak is second class if you take the path of least resistance, but third if you want a little spice or a more direct ascent. I took the third class options when they presented, and found myself at the top in time to enjoy sunrise and copious amounts of wild raspberries growing in the area. Sunrise from Cascade Falls Point. The register here was placed by Mike Garrett in 2002, and like many of the minor peaks, was pretty great reading. The first two signatures were his (his last summit in RMNP), and this one, her final summit in RMNP. This one brought tears to my eyes. There is certainly a bond that forms between two people who share the wilderness together. We'll remain friends forever. The last ascent was in 2013 by none other than Steve Knapp and his son. I left the date and my name. And then it was onward. I descended the way I intended to come up. More bushwhacking. I got back to the trail scratched up and dirty. Well, filthy might be a better word. I slipped while heading down some loose soil and fell backward into it. My arm was covered in fine dirt. And it was so early in the day! Cascade Falls was next, a rather pretty set of a few drops over rock. But not the best waterfall I'd see over the course of the day. I continued upward, gorging myself on wild raspberries that were growing all over the place, and right next to the trail. I finally told myself I had to stop, both so I'd have some left on the way down, and so I wouldn't incur any fruit induced intestinal distress! I passed by Big Pool and was tempted to jump it, but it was still early in the day and too cool. Next up I planned to hit War Dance Falls and then make my way to Bench Lake. Here is where I took a dumb wrong turn and lost almost two hours of time. 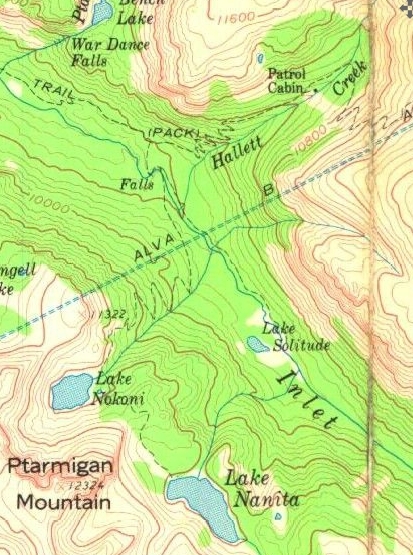 The topo I have clearly shows Ptarmigan Creek intersecting the trail between the Grouseberry and North Inlet sites. There is a small stream there. It looked too small to hold a waterfall, but to be frank, some of the named waterfalls in RMNP aren't really all that spectacular. I went a little farther along the trail and didn't hit anything, so I supposed this was it, and followed this small stream up. I kept questioning it, as I saw nothing that looked like a distinct waterfall, nor did I find anything that looked like a faint trail on the east side of it, as there was said to be. I kept following it up and up. An hour later I was at 10250 feet, over a hundred feet higher than Bench Lake. The big problem was that I'd yet to reach the lake! Looking up, there was no end in sight. I was clearly in the wrong place. It didn't take me too long to figure out I was west of where I wanted to be. Nearly forty five minutes of bushwhacking and talus hopping later, I finally hit a significant creek. I was in the right place at long last. This was truly a spectacular waterfall, though with so much elevation loss from the exit at Bench Lake, it was hard to pinpoint a specific place as "the falls". Again, this seemed like a series of large cascades, but very sustained. After a bit more bushwhacking, I was able to cross the creek and find a thin trail on the other side. Shortly thereafter things leveled out and I found myself at Bench Lake. I took my shoes off and had a snack. It was very relaxing. I was angry at myself for a dumb navigational error. But oh well. I was on the right path now. I headed back down and found the trail to be pretty well put in. There are places where it becomes less distinct (in rocky areas for instance) but follow the cairns and the lay of the land and you'll end up in the right place. I ended up rejoining the trail at the Ptarmigan site. Funny enough, not thirty feet away from the site I found a pile of large bones. Nature is also out there while you are sleeping. I continued up the trail, passing by North Inlet Falls. This was a pretty cool waterfall, and easily accessible. It was more what I think of in a waterfall, which is to say one big drop versus a series of smaller cascades linked together. It occurred to me that most of the named waterfalls in RMNP are pretty close to trails. Not too many people really go exploring. From here I finally got to experience some more significant elevation gain. Most of the trail up until now had been pretty flat gain, which is to say upwards, but not steeply. Heading up the switchbacks to Lake Nokoni gets the pulse up, gaining almost 1000 feet from the first right hand turn to the lake. This brings some increasingly good views of the peaks to the east. As I've said before, it has been pretty neat this year to see the opposite side of the mountains that I know so well. Lake Nokoni was reached. I was still feeling pretty good here, and the weather was still holding, though I can't say it looked great. My next goal was Pettingell Lake. This lake lies no more than seven tenths of a mile from Lake Nokoni, but will go down in my book as one of the most inaccessible lakes in the park. 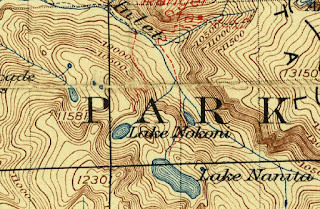 You just have to head up to the saddle north of Lake Nokoni, between points 11733 and 11322, and then drop down to the lake. In reality, going up the 400 or so feet is fine, with relatively easy movement. But coming down the 700 feet or so on the other side is steep, forested, rocky, and loose. And bear in mind that you won't be able to see the lake from the saddle, in fact won't be able to see it until you're almost there. But it's there. Trust me. I refilled my water from this lake that must see under ten people a year. Another case of lying close to a trail, but not on a trail. The whole point of this blog is to convince you to make the extra effort and go off the trail. Get lost and find a rarely visited and absolutely beautiful body of water out there. But if you are keeping track, bear in mind that it is about 1.4 miles round trip, and 1200 feet of elevation gain to get here and back to Lake Nokoni. Going back up was less fun. I added on a few more scratches, though the bushwhacking was somewhat less intense than what I'd found earlier. Back at Lake Nokoni, a light rain started to fall. I got my rain gear on, had a snack, and headed down to reach my final destination of the day, Lake Solitude, which still lie 9 miles from the trailhead. Interestingly enough, there once was an official trail to this lake. 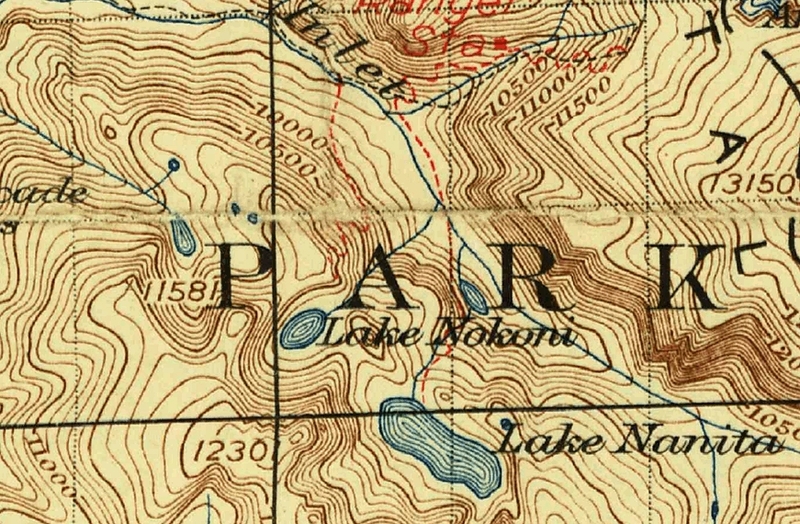 And from the 1961 map. It appears that this trail was abandoned at some point after 1961. You'll note the trail doesn't exactly follow the same line, and in the older map it also goes to Lake Nanita. I did not see any evidence of it today. It looks like it splits off shortly after North Inlet Falls. I will have to explore there a little bit next time. I took the route recommended by Foster. After North Inlet Falls, you want to go to the first right hand switchback as the trail starts to gain elevation. From here, simply head straight (southeast), bushwhacking through the forest. Yes, more bushwhacking. It took me approximately half an hour to get to the lake using this method. This switchback lies about 80 feet above the lake, so you'll have to come down a little in elevation. Go too far down and you'll be in a marshy valley with a small creek running through it. I did find and use a few animal trails going in the general direction that I wanted to go, but this is another short off trail adventure. At Lake Solitude. This was a nice, quiet, and peaceful lake. Please note there is also a Solitude Lake in RMNP. It is located on the east side, in Glacier Gorge. Going back to the trail was a bit easier since I had some idea of where I was going. I regained a small amount of elevation, but planned to hit the trail below where I'd left it. I wasn't entirely sure I'd done this until I arrived back at North Inlet Falls. I stopped to change socks since my feet had gotten wet. I ate a big snack and started to race the sun back to the car. I'd now been hiking for a little over twelve hours and was ready to be done. Back at Big Pool, it was now on the other side of the day and too cool again. I'd really like to jump in there at some point. I could look down into the crystal clear waters and see fish swimming around. I was able to run some of this long, flat downhill, but eventually reached a point when I decided I didn't have any more running in me. Hiking quickly would do. I left myself plenty of raspberries to enjoy on the way down. They were just as tasty as they were on the way up. I got back to the car at 7:44, narrowly winning the race with the sun. I had a snack, and started the drive back. Ironically, I haven't had a RMNP pass in almost two years, since I normally arrive well before the entrances are manned. On this day I got to the Grand Lake entrance shortly before the day ended, and bought a pass so I could drive back home after hiking all day. I will admit that after such a long day I wasn't much concerned with things like speed limits as I drove over Trail Ridge Road and down 36 to Lyons. Of course, I made sure to abide by them in the towns I passed through on the way and once I got back to Longmont, but I was comfortable with plus five or ten most of the way back. Even then, I got home as I'd left: in darkness. This was another fun and big day in the park. The lone peak of the day clearly doesn't see many people, with nearly two years passing between the last ascents. There isn't much of a view from the top, yet it was pleasant, despite feeling like I'd been chewed up and spit out by the time I got back on the trail. The waterfall winner of the day would be War Dance Falls in my book, quite pretty. Just make sure you are at Ptarmigan Creek (which is signed) before you start up. As for lakes, if you've read this blog at all, you know my preference is for the things that don't see alot of traffic. Pettingell Lake was clearly the one that fit that criteria. Right below treeline, this lake is difficult to get to, with the one way distance being 11.1 miles. While the other lakes visited this day were just as pretty, there is something to knowing you have made an effort that few others have, and may very well be one of only a handful of people to visit this lake in any given year. Summerland Park, 8520 feet: 1.3 miles, 20 foot gain. Easy. Cascade Falls Point, 9723 feet: 3.5 miles, 1223 foot gain. Moderate. Second class or more. Cascade Falls, 8800 feet: 3.6 miles, 300 foot gain. Easy+. Big Pool, 8920 feet: 4.8 miles, 420 foot gain. Moderate-. War Dance Falls, 9900 feet: 7 miles, 1400 foot gain. Moderate. Bench Lake, 10140 feet: 7.3 miles, 1640 foot gain. Moderate+. North Inlet Falls, 9480 feet: 7.8 miles, 980 foot gain. Moderate. Lake Nokoni, 10780 feet: 10.3 miles, 2280 foot gain. Strenuous-. Pettingell Lake, 10500 feet: 11.1 miles, 2000 foot gain. Strenuous. Second class. Lake Solitude, 9740 feet: 9 miles, 1240 foot gain. Strenuous-. As a whole, this hike covered approximately 23.9 miles with 7418 feet of elevation gain. Strenuous+.